Having been in the irrigation business in Oklahoma for several years, Trader Dave was asked one day to build a drip irrigation system for a local commercial greenhouse that was growing hydroponic tomatoes. The whole concept piqued his interest and he would visit them often to keep track of how the operation was going. When the owner of the business became pregnant and could not keep up with the demand of two greenhouses, Trader Dave was asked if he was interested in renting one. With his interest in processes being used, he naturally accepted the offer and began growing his own tomatoes. This led to an enjoyment of growing tomatoes. The Kygar Road Market began operating on the honor system when Trader Dave began traveling to set up dealers for his products. This means that visitors are expected to do their own bagging and make their own change for any purchases they may make. We believe when you visit the market, you should be allowed to make yourself at home and have had very few problems throughout several years of following this system. The Trader Dave’s farm spans three and a half acres on the east edge of Ponca City in North Central Oklahoma. The property utilized currently houses a home-built 50’ by 60’ greenhouse that contains aquaponic systems and a 60’ by 90’ commercial greenhouse that is designed specifically for growing hydroponic tomatoes and vegetables. With the dramatic increase in price for natural gas, raising tomatoes became impractical since heat is one of the key factors in growing them. This led to the commercial greenhouse being inactive for the last few years. With growth, Trader Dave enlisted help to take over the wholesale routes for the business. The company is now excited to concentrate on Internet sales, fund raising opportunities, gift baskets and corporate gifts. We are excited for the next chapter in the evolution of Trader Dave’s. We ask you to browse our site to find some really special products to share with your friends and family. 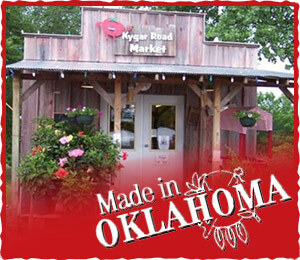 If you are in the Ponca City area, you are welcome to visit the Kygar Road Market as well. Should you have any questions, give Trader Dave a call at (580) 716-2681. He’s easy to get a hold of.